I don't know that there is necessarily a "correct" answer. I'm sure there are use cases where each is more appropriate, although I find myself reaching for Sass more often. Let's get into each a bit more so you can decide which you prefer! 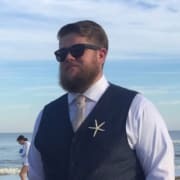 I will be using Styled Components in this post, although I'd suggest checking out each of these since each has it's own syntax and works a bit differently. The documentation for each of these is pretty good to learn the basics and see which feels most comfortable. Inside of the Card variable, we can also drop in media queries to make things a bit more responsive. 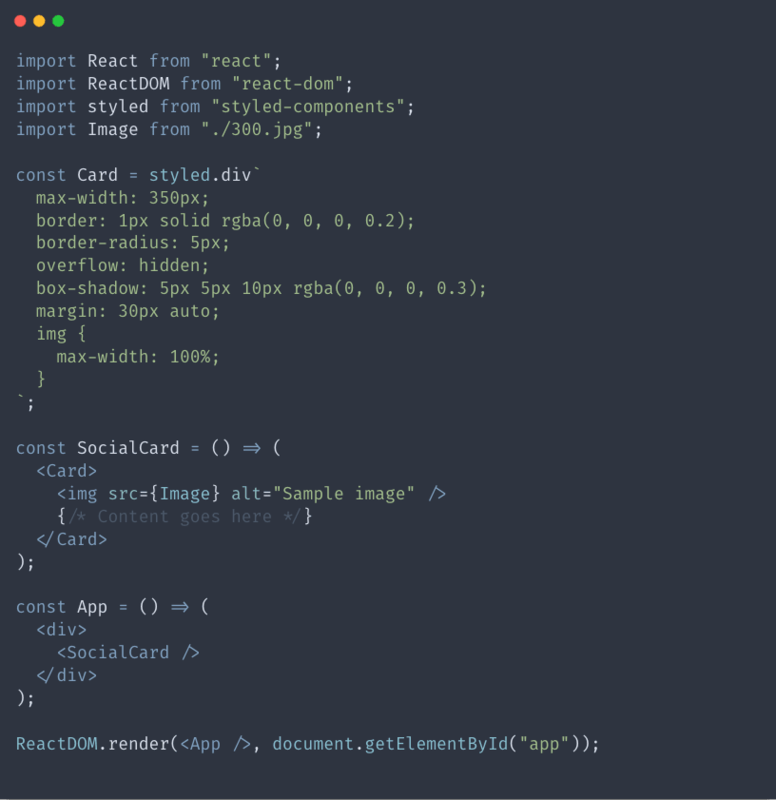 If we add a media query like the code below, you can see that when we reach a max-width of 1000px the card background turns red. This isn't a style we actually want to add, it's just for demonstration purposes. Using CSS-in-JS allows us to keep styles local instead of everything being global or having to add a ton of classes to everything to make it work. This means things can be more concise and we don't have to worry about one style overriding another. In addition, it means we always know where to look if we need to change the style. 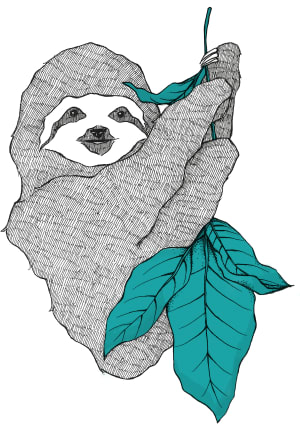 We don't have to go rooting around in a bunch of CSS files looking for a class. 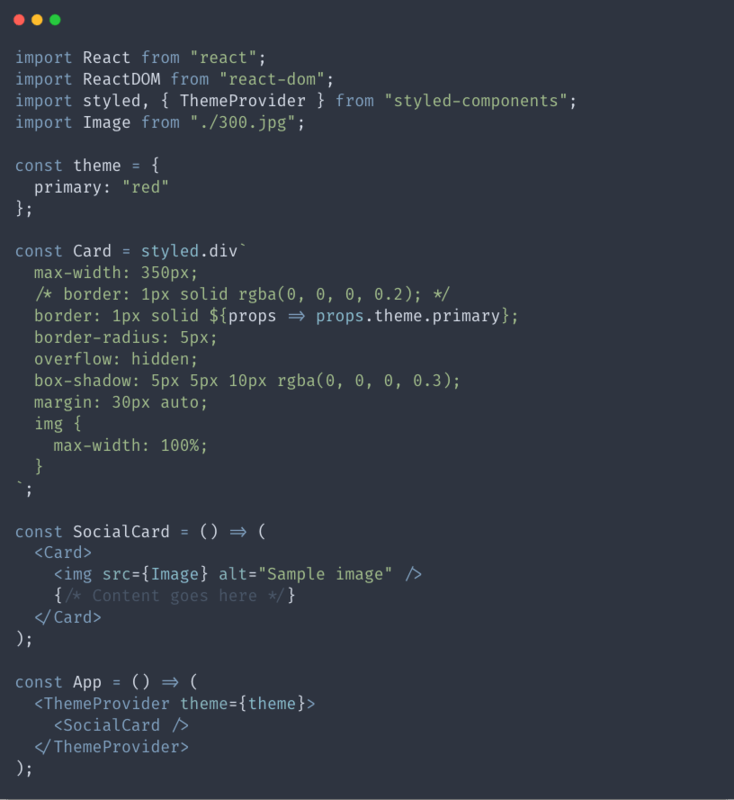 To do this, we should import the ThemeProvider component from styled-components and provide a theme variable. 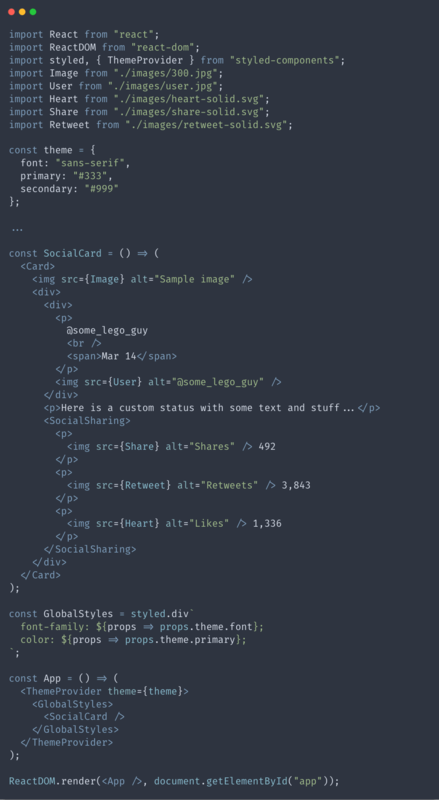 The theme variable will contain any global variables we wish to use with our styles. For instance, if you have a primary color you are using for the navbar, buttons, and links, it doesn't make sense to hardcode that in every time you want to use it. 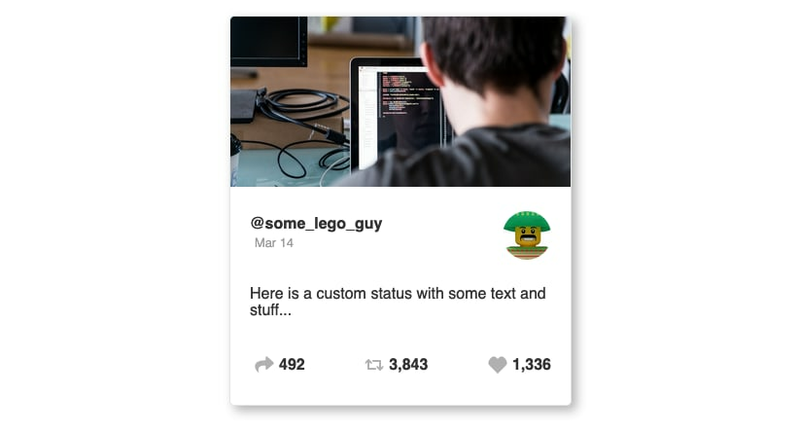 To demonstrate this, let's add some global styles and some content for our social card. 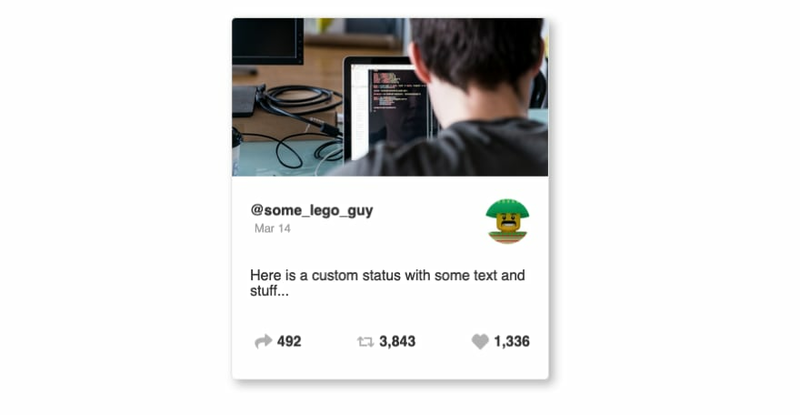 The code below adds the necessary content to the social card and also adds a few global styles to be applied to text. This is obviously a pretty basic example but it's a simple way to get our feet wet with Styled Components. There are also some more in-depth things we can do with it, which we can learn about in the documentation. Sass was created several years ago and was originally implemented in applications built using Ruby. In recent years, it has been adapted to work with Node.js which is how we will be using it today. You may notice that we are creating "scss" files but calling it sass. This is because Sass was originally created with a certain syntax which is actually known as "Sass". Later an alternative syntax was created to closer resemble CSS, and this is called "Scss". 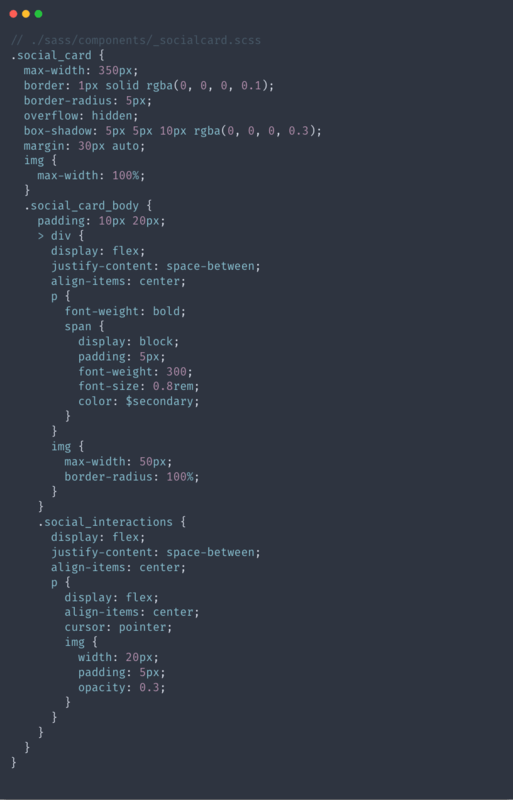 Because Scss has the same functionality of Sass, it still falls into the category of Sass. An alternative is to create a Sass folder within our project and this is where our styles will live. This is the organizational method we will be using today. That being said, we will create a folder in the project called "Sass" and add a file called "app.scss". While we could put all of our styles into this app.scss file, that would get messy and wouldn't provide much benefit over normal CSS. /_elements.scss - Any generic styles for the site. Shouldn't have any classes or ids for selectors. /_keyframes.scss (optional) - Any keyframes or animations I will be using for the site. Since our application is only one social media card, we won't need all of these. 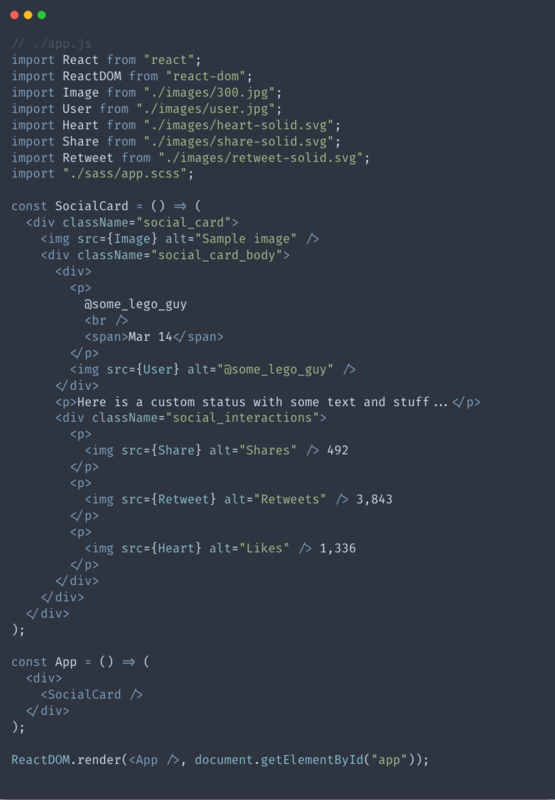 For the sake of simplicity while explaining this, we will be using the app.scss, the _variables.scss, and the _elements.scss files as well as the components directory. Awesome! 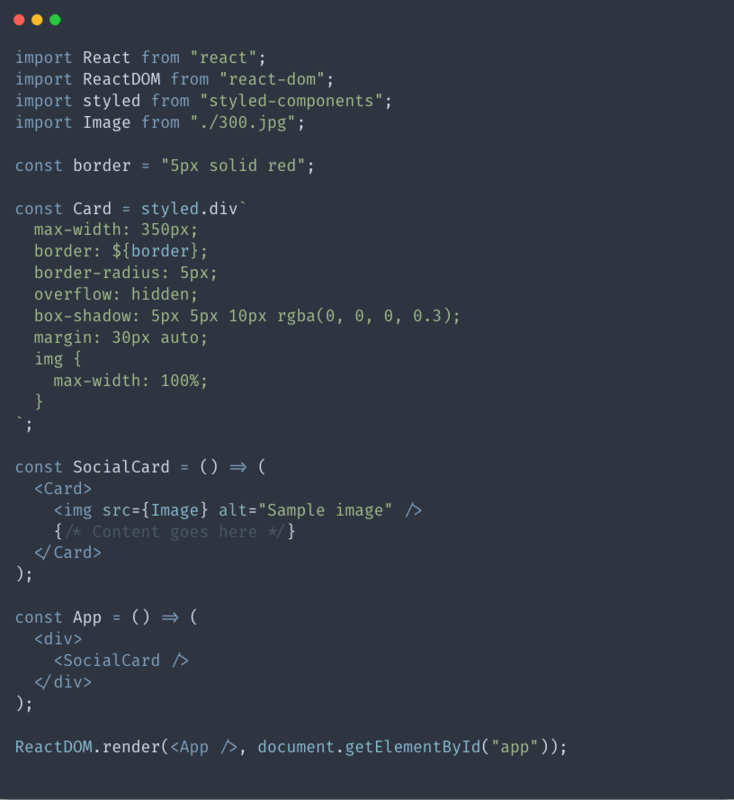 Let's start styling our component! Inside the Sass folder, create a new folder called "components". 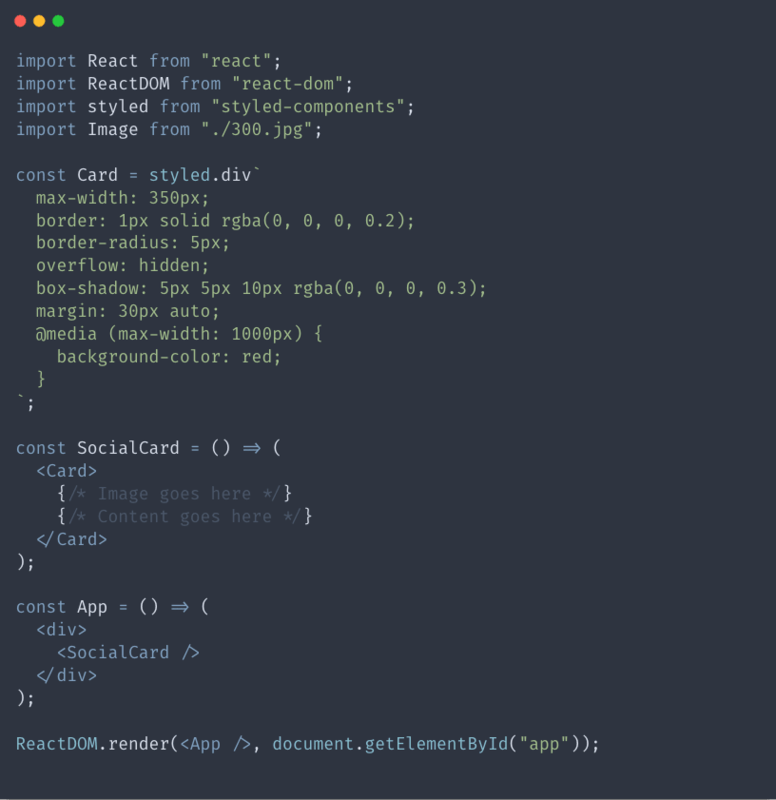 This folder will hold the styles for all of our React js components. Typically, I would put each component into it's own file, this is a pretty simple application so we will keep it in the app.js file. 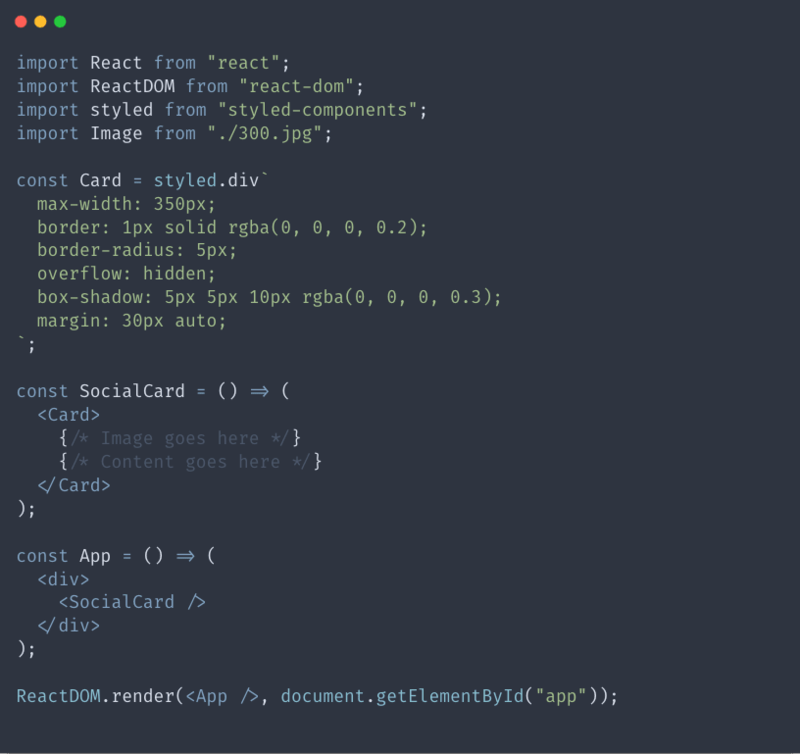 As you can see, both Sass and Styled Components are valuable ways to supercharge styles in React js applications. 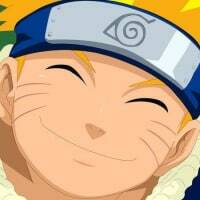 Ultimately, I think that you should use the one that you enjoy using the most. I find myself reaching for Sass more often, but I also enjoy using CSS-in-JS in some of my personal projects. If you'd like the code referenced in this post to look at or play around with, it can be found here. What do you think about next generation of zero-runtime CSS-in-JS, where you do not need to put CSS parser to client-side JS bundle? They allow you to keep CSS in JS files, but allow to use Sass/Autoprefixer and generate the same static CSS file. I haven’t ever heard of these. I’ll have to check them out for sure! Thanks for the links!